BBC WM, Midlands Masala talking about Four Fathers Projects and New Birmingham Library. Talking about the launch of the new Birmingham Library and the origins of the Four Fathers project. 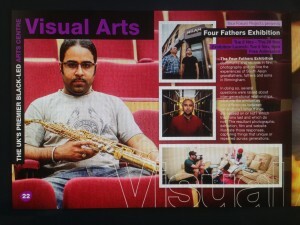 Four Fathers Exhibition at the drum Arts Centre, Birmingham, from Tuesday 5th November 2013. The Four Fathers exhibition will be at the Drum Arts Centre from the 5th November til the 28th November as part of the Drum’s Autumn season! Please click on the photo below for more details. Also do visit the drum’s website.